Cadastre is, according Wikipedia, a real-estate registry or real property’s metes-and-bounds of a country. It commonly includes attributes like ownership, tenure, precise location, dimensions and area, and value. Cadastral data basically consists of lots of land parcels. And as one can imagine, it will be a time consuming and enormous task to collect and maintain the cadastral data. 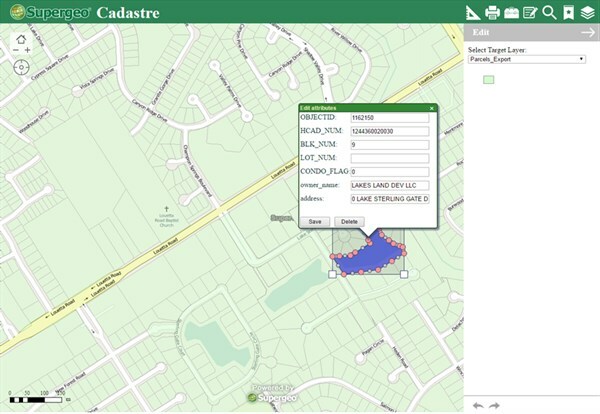 Cadastre is mainly used to define the dimensions and location of land parcels described in legal documentations, which makes it a source data in disputes and lawsuits between landowners. And for GIS, cadastral data is a basic element for land management and building construction. 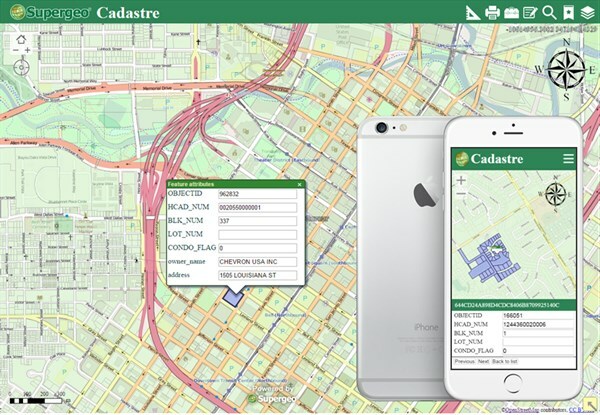 These are the reasons why cadastral data are so important that even though it is difficult to build and maintain, every city still needs to have their own cadastral databases. This article introduces how users can use SuperGIS Server to build an online cadastral platform. With the platform, users are able to access the cadastral data and even can modify the data in no time. With SuperGIS Server 3.3, users can publish the cadastral data and share them through the Internet. As shown in the figure above, users can identify land parcels to access detailed information in the web application. Also, the web application supports mobile layout. Therefore, the shared information can be accessed anytime and anywhere within just a few clicks on your smart devices! In addition to query, users can also directly measure the perimeter and the area of parcels on the map and print out the map immediately if they want. These are all the powerful tools provided by the default web application. With the powerful editing tool provided by SuperGIS Server 3.3, users can edit the geometry or attributes of each feature and apply modifications to the cadastral data. The editing tool is available both on PC and mobile platform. People may want to know the performance of SuperGIS Server when dealing with a huge dataset like cadastral data. And Supergeo had completed a performance test that simulates 300 users editing an online layer that contains 1.5 million records at the same time during 3 minutes. And the test result indicated that SuperGIS Server is able to respond all the 609 requests within less than 5 seconds. There is a trend to move most GIS applications from 2D to 3D and in cadastre as well. With 3D visualization, users can query the data in a more intuitive way. For example, to identify the cadastral data of the 2nd floor in a building, it would be much easier to accomplish that in the 3D environment than in a 2D one. And that is why people want to display their cadastral data in 3D recently. Supergeo provides SuperGIS 3D Earth Server that allows users to visualize the building models and terrains in 3D and simulate a Smart City solution. It will be a superb choice for you to build your own 3D cadastral platform!